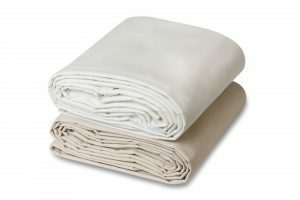 Extra Wide Canvas Fabric - Cotton - 14'5"- 32'9"
Chicago Canvas & Supply’s line of Extra-Wide Canvas is ideal for those applications requiring larger backdrops. Cotton Canvas is tightly woven and a heavier fabric than muslin. Extra wide cotton canvas is perfect for large, seamless painting surfaces. Extra wide widths are available in White and Natural Flame Retardant or Natural Non-flame Retardant.